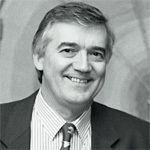 Robert Cailliau was Tim Berners-Lee’s first collaborator on the World Wide Web project. A tireless promoter of the Web, he established the World Wide Web conference series, and was a member of the conference committee from 1994 to 2004. “My 30 years at CERN have been quite incredible. As a young engineer working on ways to improve human control over complex technical systems, I had heard of CERN. But it was only when I first came here in 1974 that I fully understood the depth and scale of the undertaking. A CERN project that my university was involved in led to my being hired and joining a group that was to develop one of the most interesting computer-assisted systems that I have ever seen. This was the 1970s, but what we built I can only describe in terms of today: we had touch-sensitive screens, graphic user interfaces, applets that propagated themselves over the network, instant messaging. It's hardly surprising, then, that CERN should have provided fertile ground for the invention of the Web at the end of the 1980s. I came out of that initial project with a vision: give everyone a keyboard and screen, link them through the CERN–wide network, and the benefits would be huge. Of course I was not the only one to have seen this, especially in a place like CERN where we kept ourselves well informed of what happened on the rest of the planet. There were many attempts to create an accessible electronic library: CERNDOC, NOTIS, and several other systems with names all in capitals. But it is one thing to have an idea, quite another to put it into practice. And that's where Tim Berners-Lee comes in. Tim had an idea, and the means to turn it into reality. When I first started working with him, his idea had no name at all. In May 1990, we decided it needed a name. I had strong ideas about what the name shouldn't be. No Greek gods or Egyptian pharaohs, much in vogue among the physics community. Nothing all in capitals either, but something concise. I might as well have saved my breath, because Tim knew already that he'd call his invention the World Wide Web. Even before it had spread beyond a few physics labs, Tim knew where it was going. For the next ten years, the Web took over my life, but it didn't really feel like work. I've moved on from the Web now, but Tim is still in the thick of it. I know that his vision goes beyond the read–only implementation of the Web we have today. I hope one day we'll all be able to see what he had in mind back in May 1990.